The release date for Hollow Knight’s Gods & Glory update is scheduled for next month, bringing a whole host of fresh content to celebrate “final chapter for the knight.” Developer Team Cherry says this is the biggest update to the game yet, and has provided a new trailer with a taste of what to expect. Gods & Glory launches for free to all Hollow Knight players on August 23. The update brings the Godseeker to town, a “disturbing yet alluring being” who’ll set you on new quests against new foes – including loads of new boss fights. You can expect plenty of new NPCs and additions to your charm collection, as well as a third game mode unlocked when you beat the new story. Celebrate old school and new school alike with the best indie games on PC. New content also means new music, and Christopher Larkin is naturally providing plenty more tracks for the update, ranging from new boss music to remixes of old favourites. If you’re feeling guilty about getting all this new stuff for free, you can buy Hollow Knight: Gods & Nightmares. This soundtrack pack collects all the tracks added in the content updates in a single package for your listening convenience, and will be available on Steam, iTunes, Bandcamp, and Spotify on August 9. Find out what to expect from Gods & Glory in the trailer below. 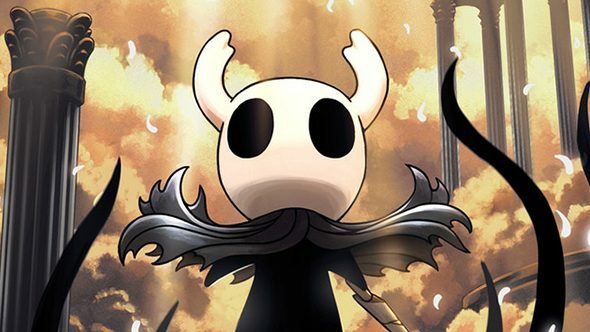 Hollow Knight sales have continued going strong, with free updates buoying the indie since its launch last year – not to mention its quality take on the Metroidvania formula. Gods & Glory promises to be one more excellent addition to an already terrific game.